Baby’s first spoonful can be a delight or a disaster. Once baby has expressed signs that they are ready to start solids, and are old enough to, you can introduce him or her to a whole new world. There is some controversy at the moment in Australia as to the right age. Some say it is 6 months with allergens introduced after one year and others say 4 months with allergens introduced before 6 months. You may want to do some research as I cannot recommend, but only tell you what we did. First Foods at 4 or 6 Months? 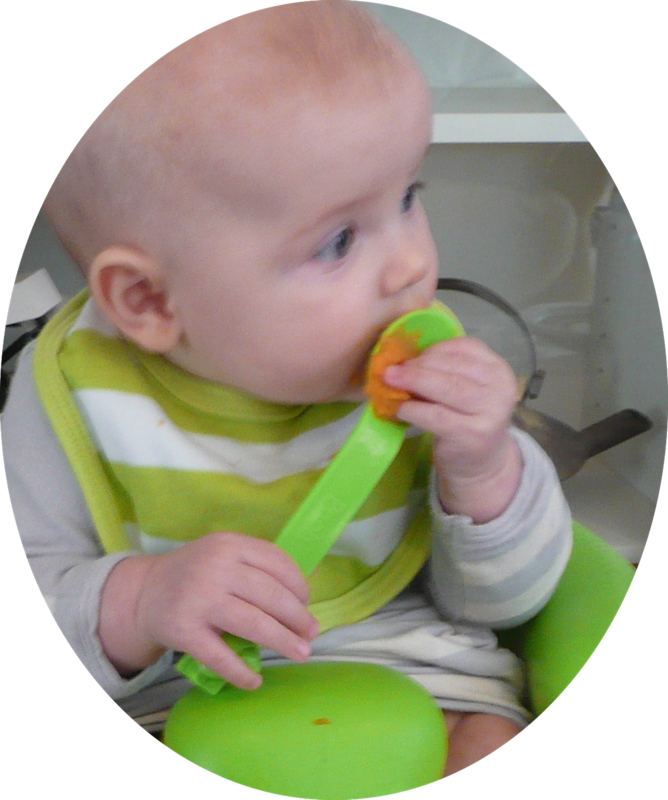 Both Western Australia and Queensland government recommendations are to start feeding baby first foods around 6 months. As are the Sydney Children’s Hospitals. The Mayo Clinic recommends between 4 and 6 months and also has the following to say: “To help prevent food allergies, parents were once told to avoid feeding young children eggs, fish and peanut butter. Today, however, researchers say there’s no convincing evidence that avoiding these foods during early childhood will help prevent food allergies.” In fact there has been some evidence presented by the Royal Children’s Hospital that introduction before 6 months will help prevent allergies. A report from the Royal Children’s Hospital by Professor Mimi Tang recommends introducing solid food to baby between 4 and 6 months. ASCIA is Australia’s leading allergy and clinical immunology society. They have very comprehensive, if complex, information on their website. ASCIA’s recommendations are also to introduce solids to baby between four and six months of age, while breastfeeding. We started our baby on solid foods at four months and a day (do not start before 4 months as baby’s digestive system is not ready) and our bub is very happy and healthy. A month later, she now enjoys a variety of vegetables and fruits as well as meat broth (home made stock), egg yolk and coconut cream. While the controversy over starting at 4 or 6 months may seem heated, it is nothing compared to the controversy over rice cereal and grains. I read several reports on the detrimental long term affects of feeding babies on rice or other grain based foods, as well as the danger of too much iron. Infant cereal is fortified with iron due to a fear that babies will be lacking in iron once they stop breastfeeding. However, the dangers of too much iron outweigh the risks of a lack. Much of the research on iron was conducted based on the amount of iron in breast milk, not the amount of iron baby can absorb from the milk. Breast milk has a low amount of iron in it, but it has a very high ‘bioavailability’. This means the iron in breast milk is very easily absorbed by baby. Due in part to the high lactose and vitamin C levels in breast milk, and just the way it is molecularly made up. In contrast, the iron in infant formula is very hard for baby to absorb. Baby digests iron from formula at 4% efficiency that they do from breast milk! Which is why commercial formula has a much higher amount of iron, so that baby can get the same out of it as a breast fed baby would. Having raised the risk of too much iron in the diet, anaemia (or lack of iron) is a very serious issue and if your baby is not getting enough iron then they will not develop properly. A full term, healthy weight baby will have enough iron stores to last for the first six months of their life. A breastfed baby will absorb enough iron through the milk to last well into the second 6 months (or to a year old). At which time they should be eating a healthy and varied diet to get enough iron. If your bub was premature, had a low birth weigh or there is anaemia in your family then you should consult with your doctor about their iron levels and get them tested. With all this controversy out there: starting solids at 4 or 6 months; rice cereal or no grains; when to introduce allergens; to fortify babies diet with iron or not… its no wonder that new moms get overwhelmed. The best advise I can give is to do a little research, ask your health nurse and then to follow your instincts. We started with high iron and low allergen vegetables: pumpkins, sweet potatoes and pear. Introducing a new food every three days, we looked for reactions to each new food. I introduced banana. Then when it came to broccoli I mixed cooked mashed broccoli with banana and broco-nana was discovered – I couldn’t get the next spoonful into baby’s mouth fast enough. There is little evidence to support that feeding fruit first will mean baby has a sweet tooth, at this age everything is so new. By the time they are a little older they become fussy and that is when it is important to keep offering vegetables to them every day. Rather controversially I found a blog that suggest softly cooked egg yolk as babies first food. So we have an egg together every day or so, her the yolk and me the more allergenic white. I also read that in Thailand babies first food is coconut, fed to them by a Buddhist priest. Coconut is not actually a nut and is a low allergen food despite the US listing it as a ‘tree nut’. It is also full of amino’s and good fats, so once bub had tried a variety of fruits and vegetables I started mixing coconut cream into a blend of different veggies for her dinner. The creamy taste seems to delight her. If you have any concerns or questions, ask your health care professional. However, they may have an opinion that is based on something you might refute. For example I don’t believe in taking antibiotics for every little sniffle and although I think my doctor is a great GP, I have a draw full of unfilled scrips he has given me over the years. When I was anaemic he prescribed iron supplements that after 2 years were not working. I did some research and started drinking a large glass of prune juice with fresh lemon juice in it every morning and my iron levels jumped up to normal. So, take everything with a pinch of salt – except baby’s food, they don’t need salt or sweetening.